This workflow shows you the steps needed to create a mosaic dataset using the Vector Field template. First, create a multidimensional mosaic dataset using the Vector Field template. Choose one of the multidimensional raster types: GRIB, HDF, or netCDF. Specify the input file or workspace containing the files. If your input is only one or two files, choose the files option rather than the workspace, as it performs faster. Click the Raster Type Properties button. Click the General tab and choose the Vector Field processing template. 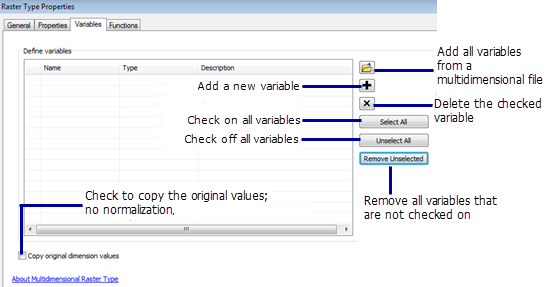 Click the Variables tab, choose two variables that are used. Set the variable type by choosing proper entries in the Typecolumn. Your data may be Vector-magnitude and Vector-direction, or Vector- U and vector-V.
Click OK to exit the Raster Type Properties window. Click OK to run the geoprocessing tool to add the data. 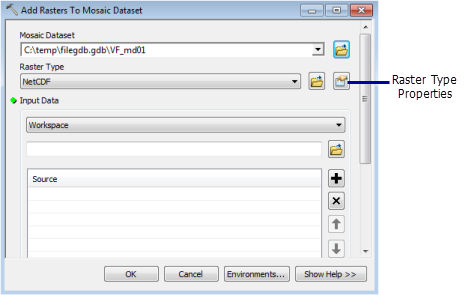 Optionally, refine the statistics for the mosaic dataset using the Calculate Statistics tool, or calculate statistics for each item and estimate the overall statistics for the mosaic dataset using the Build Pyramids and Statistics geoprocessing tool. Uncheck the Build Pyramids option. Expand the Statistics Options and check the Estimate mosaic dataset statistics box. Now you can visualize your data using the Vector Field renderer. Add the mosaic dataset to the map. Open up the Properties of the mosaic dataset. Adjust the renderer properties accordingly. If the data contains vertical, specify a z-value in the Multidimensional tab within the properties. Click OK to display the mosaic dataset with the Vector Field renderer. Use the Time Slider to visualize the mosaic dataset dynamically. For more information about using the time slider, see Using the time slider.